Word Lens is an amazing futuristic app that can translate printed text in real-time just by pointing your mobile device's camera at words. You do not even have to be online for the translation to occur. Just open up this app which accesses your camera and then point your camera towards a sign or document. This app will immediately translate what it sees to the language of your choice. Word Lens is available for Android, iOS and Google Glass. This is a really useful app for travelers who can really make use of the instant translations. You might be in a foreign country with sign boards in a different language. In another country, you can't always go online to translate. You need to know what the sign says, so you just point your phone's camera at the sign and you can see the immediate translation in your phone. You can also easily translate documents with clearly written texts. You can also translate the text in your computer screen. It works quite well for supported languages. 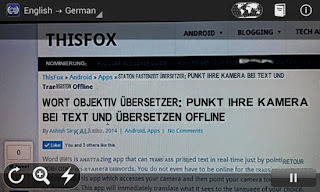 Only handwritten texts and fonts are not recognized by Word Lens. Common fonts are easily identified and translated. Just make sure that the text in the sign is clear and bright enough to use. For example: You can translate Spanish text to English and English printed text to Spanish. Keep in mind that the translations are not perfect and may sound funny. But you will get the general idea of the words which will be helpful enough to draw a meaning when you are in a foreign place. You also should have steady hands once you point your camera. If you keep on shaking, the translations will be updated or generated continuously which can be confusing. Quest Visual, the company behind Word Lens Translator has been acquired by Google. This could mean that the features of World Lens can be brought into Google Translate. So, one additional input method in Google Translate can now be your camera. We should also expect a support for a whole new range of languages as this app gets updated by Google.